Not all chrome-plating companies are equal. There are real differences in the level of chrome plating experience, level of service provided, and level of plating quality attained. 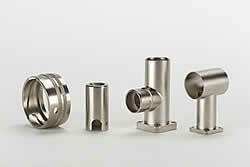 Chromplate Company seeks to combine our experience, service, and quality to find the right plating solution for you. Please review the information posted to help you make an informed decision about what type of chrome or electroless nickel-plating you should use for your product and more importantly whom you should use. If your current plating supplier has had issues of low plating quality, or slow service then it’s time to switch to Chromplate Company. If you have never used a chrome-plating or electroless nickel-plating provider before and need advice from a company with real experience on developing the right metal finishing solution, then you have come to the right place. Chromplate Company is also a member of several associations that provide important metal finishing information and resources. CHROMPLATE COMPANY IS IN COMPLIANCE WITH ALL ENVIRONMENTAL CHROME PLATING REGULATIONS. We have provided quality plating solutions since 1961. Please Call 310-641-4922 or email me.